A book perfectly timed for the re-setting of the Maya calendar in 2012.... Part history, popular science, armchair travel, and real-life treasure hunt, this is the story of pre-Columbian jade--the precious stone revered by ancient Aztecs, Incans, and Maya--and the scientists, collectors, explorers and entrepreneurs who have been searching for the mythical jade mines for more than a century. "A compelling tale.... This well-focused and well-told account brings America's most mythologized gemstone into sharp relief." 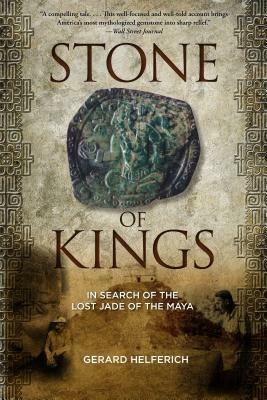 --Wall Street Journal " T]he story of the search for the long-vanished mines of the Mayas . . . with] engaging digressions into plate tectonics, the technology of jade carving and the brutal history of the regimes of a succession of Guatemalan generals. . . . Prospectors] Ridinger and Johnson endured earthquakes, coups, kidnapping, even civil war. But eventually they stumbled upon huge blocks of the alluring, elusive stone." --New York Times Book Review Selected as an Indie Next List "Great Read" "The search for the sources of this mysterious rock reads like detective fiction, and involves geologists, archaeologists, entrepreneurs, poachers, and a host of other characters, but it's all true. A wonderful read " --Michael D. Coe, author of Breaking the Maya Code.